After the Harburg Castle, the house at Neue Strasse 59 is the second most important historical building in the Harburg borough of the city. From 1642, Harburg and its environs were administered from here by a chancellor appointed by the dukes of Braunschweig-Lüneburg. In 1710, a new representative half-timbered structure was built above the old vaulted cellar. The house was constructed as a two-storied timber-framed house with a Baroque hipped roof. The half-timbering is simple without embellishing stonework. In a later renovation around 1780, a grand classical staircase was added, which is extremely rare in Hamburg. 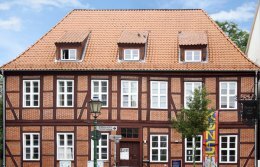 The house is used by the association Women’s Cultural House Harburg (Frauenkulturhaus Harburg e.V. ), which offers cultural and educational events at the venue, organises a girls’ group and runs the gallery “Kunsthafen 59”.